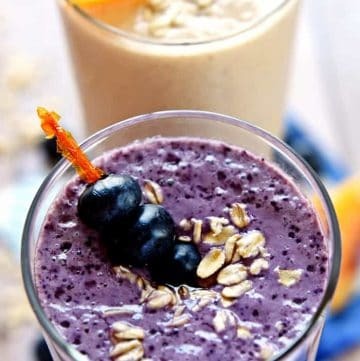 This Healthy Oatmeal Smoothie made with ground oats, yogurt, and frozen fruit has a thick, creamy texture, in blueberry muffin or peach cobbler flavors! I recently discovered the most delicious and most filling breakfast smoothie recipe of my life…a Healthy Oatmeal Smoothie! I am so excited to share this recipe with y’all. 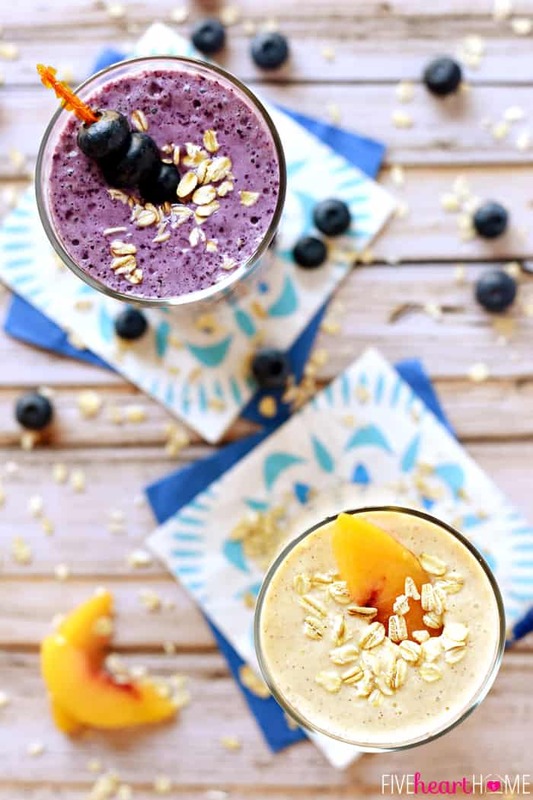 These particular oat smoothies taste just like a blueberry muffin and just like peach cobbler…not even kidding! It’s almost eerie, really, how a blended beverage can taste like a baked good, but it does…these do! I’ve been seeing oat smoothie recipes for a few years now, but I have to admit that I never felt compelled to experiment with adding raw oatmeal to my typical smoothie base of frozen fruit and yogurt. And then came along my daughter who, at the sweet and compliant age of two, has decided that she doesn’t want to eat anything besides cheese popcorn, cheese sandwiches, cheese quesadillas, peanut butter crackers, and the occasional apple slice. We’re talking breakfast, lunch, and dinner here, people. The wide variety of fruits and veggies that she happily ingested as a baby? Well, apparently her tastebuds are taking a hiatus from those flavors. Hopefully her interest in venturing outside of the beige-to-orange color palette will return at some point, but in the meantime, I’m having to get creative at making sure the stubborn child is not subsisting on carbs and cheese alone. Most days she will drink a smoothie, so I had the idea of sneaking in some oats, since that seems a more fitting breakfast than cheese popcorn. And you know what? She fell for it liked it! And actually, so did my older kiddos…and so did I! 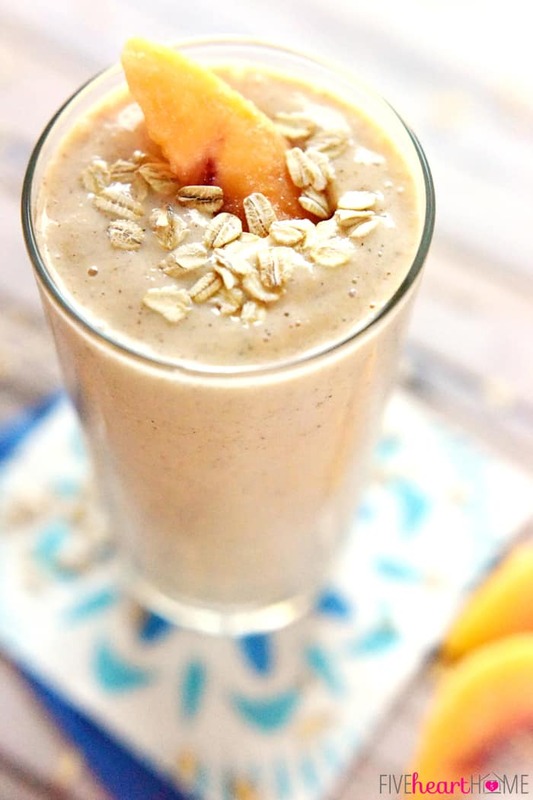 An oatmeal smoothie is thick and silky and definitely more filling. But I also thought the oats lent an undertone like some type of baked good was ground up in there. So I decided to experiment a bit and see if I could expand upon those flavors even more! 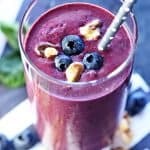 It was as simple as adding a smidge of pure vanilla extract and a sprinkle of cinnamon to make a blueberry oatmeal smoothie taste like a Blueberry Muffin Smoothie! And since I like my peach cobbler extra-cinnamon-y, I upped the cinnamon a bit more for the Peach Cobbler Smoothie variation. I am telling, y’all…it’s hard to believe that smoothies can taste like baked treats but these honestly do! For the best results, I recommend first grinding your oatmeal in the blender until it turns into a fine powder. I don’t know about you, but I prefer the thickening power of ground oats over getting chunks of whole oats through my straw. No need to clean out the blender after this step. Just add the rest of the ingredients and proceed with your smoothie making. You can use whatever type of milk you prefer — whole milk, skim milk, almond milk, etc. However, using vanilla yogurt (as opposed to plain) will add flavor and sweetness. I also add a squeeze of honey, but if your fruit is particularly sweet, you can skip that step. It’s definitely recommended to use frozen fruit for a nice, cold smoothie without the dilution of ice. I typically buy bags of frozen fruit to keep in the freezer, but if I have fresh fruit that’s overripe or about to go bad, I’ll wash it, cut it up, put it in a baggie, and freeze it for future smoothie-making. Feel free to change up the fruit you use in these smoothies as well! I used strawberries one day and the resulting smoothie tasted decidedly strawberry muffin-ish. So does anyone else want to get on the quick / easy / healthy breakfast smoothie bandwagon with me? I think we can do it, y’all…with the flavors of blueberry muffins and peach cobbler, to boot! 😉 So whether you whip them up for yourself, your kiddos, or your entire family, I think you will love a Healthy Oatmeal Smoothie in your favorite flavor! Measure oats into blender. Blend until ground into a fine powder. Add frozen fruit, vanilla yogurt, milk, honey, vanilla, and cinnamon. Blend until completely smooth. Serve immediately. You may use nonfat, lowfat, or regular vanilla yogurt. You may use whole milk, 2%, skim milk, almond milk, or your favorite type of milk. Feel free to experiment with substituting different kinds of fruit. You are too sweet, Megan! I hope you love them both if you have a chance to try them! You’ll have to let me know which one is your favorite… 😉 Hope you’re having a happy 2015 so far! Pinned and stumbled! Found you on Create Link Inspire, by the way. Thanks for sharing! Thanks so much for hopping over, Chelsey! 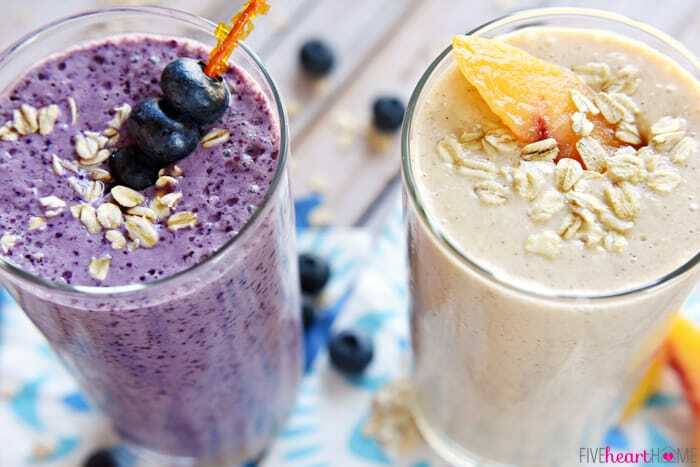 I hope you love these smoothies when you have a chance to try them. I really appreciate the pin and stumble and I hope you’re having a fantastic week! These sound so delicious. 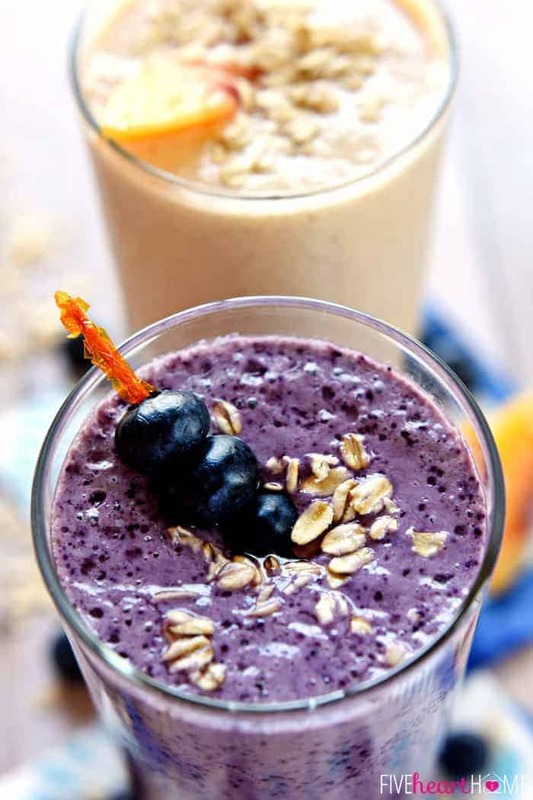 This is the second time today I’ve come across oatmeal in smoothies–must be a sign! 😉 My daughter loves her smoothies so I’m always trying to think up new combos for her (okay, and for me too!) Thank you! I’m on board with of of your resolutions! I felt like I was reading my own blog, except I don’t have one! ;p I have recently decided that I too need to start taking better care of myself (I’ll be 40 this year, sshhhh). As I read this, I’m proud to say that instead of a second cup of coffee, I’m drinking a glass of water. I have stopped making iced tea as well! So I’m on my way! I can’t wait to try these! Thanks for the recipes and thanks for letting me know I’m not alone! Ha, Mandy…well maybe you should start your own blog! It’s almost like therapy, seeing as how I feel like I’m just rambling through all of my thoughts most of the time, half forgetting that I have an audience. 😉 And way to go on the glass of water instead of a second cup of coffee! 😉 Seriously, though, I appreciate your commiseration, and I’m only slightly behind you on the birthday front. Here’s to almost-40! Now that it’s getting closer, I’m not terrified of like I once was, so I guess that should be considered progress… 😉 Thanks for the comment and hope you have a great week! Ok, so my husband and I are seriously addicted to these smoothies! You weren’t kidding when you said it tastes like your drinking the actual baked good!!! Yummy!!! Thank you! These are by far my favorite! Please keep sharing your great healthy recipes. I’m working hard at getting my 2 and 4 year old excited about their healthier options. It’s crazy how much these smoothies taste like baked goods, isn’t it, Mandy?! I’m so glad that your family has been enjoying them. 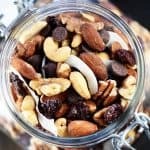 I have young children as well and have shared quite a few healthy, kid-friendly recipes on the site, so I hope you find some other things to try. 🙂 (A couple of my kids’ favorites are the granola bars and banana muffins…you can search for both!) Hope you’re having a great week! So this morning I realized I had no yogurt for my usual weekend protein flax smoothie I make. I remembered this recipe of yours so kinda improvised — mine became a strawberry oatmeal cinnamon protein powder ground flax milk ice smoothie! It was your recipe that inspired me and while the yogurt would have helped wow! The oatmeal cinnamon makes it sooooo yummy!!! Thanks. You saved my Saturday am… and my taste buds says this will become a favorite. I so enjoy your blogs. Ha, Jo Ann…this made me laugh! I’m so happy you enjoyed the oatmeal cinnamon twist in your smoothie. And by the way, your variation sounds delicious. One day, I myself will definitely have to try a Strawberry Oatmeal Cinnamon Protein Powder Ground Flax Milk Ice Smoothie! 😉 Thanks for taking the time to comment and I hope your week is off to a fabulous start! I discovered oatmeal smoothies a few months ago and love how filling they are! These two flavors look incredible! I’m pinning them to try very soon! I love how filling oatmeal smoothies are as well, Krstine…I only wish I’d discovered them sooner! 😉 Thanks so much for the comment and the pin…hope you have a great week! I just made the blueberry muffin smoothie and it is soooo good! I used Greek yogurt, because I always have some in my fridge, and added only the tiniest bit of honey since I’m trying to watch my sugar intake. 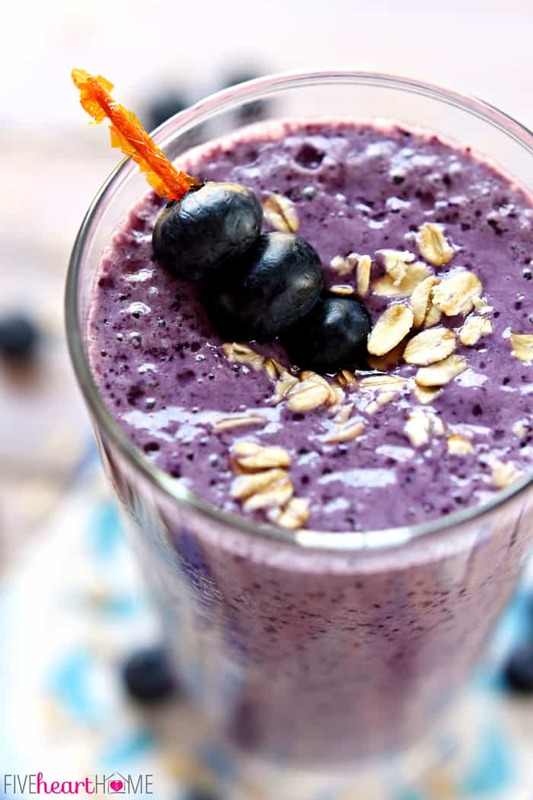 That little bit of cinnamon and vanilla really make this smoothie taste like a blueberry muffin! So glad you enjoyed it, Kristine! I’m sure the Greek yogurt made it even creamier…yum. 🙂 Thanks for taking the time to let me know that it was a hit! These smoothies look great. Do you have the nutritional breakdown or WWP+ for them? I’m going to try the blueberry for breakfast tomorrow. About drinking water, it’s very important to drink as least 8 glasses a day, go to http://www.watercure2.org to read about how healthy and why. I raised 6 children, and did my best to give them their vitamins and nutritous food. Now I have to take care of myself, made it to 80 yrs young, and feel great. So you must do your best to take care of yourself while doing for your family. Love your blog. Thanks so much for the comment, Marion…I appreciate you sharing your wisdom here. 🙂 Raising six children is certainly something to be proud of! I’m so glad you enjoy the blog and I hope you enjoyed the blueberry smoothie. Have a great weekend! Hi BakerGirl! I’m so sorry that this didn’t turn out to your liking. I’m honestly a little perplexed because I make this smoothie regularly and I’ve never had the problems you encountered. If you grind your oats into a fine powder, the smoothie should have a bit of texture but it shouldn’t be gritty. And if you’re using frozen fruit along with those ground oats, the smoothie should actually turn out really thick and not runny at all. In fact, if anything, you might have to add slightly more milk if it’s too thick. As for the sweetness, that’s a matter of personal preference and also depends on the sweetness of your fruit. If your fruit was tart or not very sweet to start out (or you prefer a sweeter smoothie in general), you will need to add a bit more honey to taste. I wish I could help you with the other issues you had but the sweetness part is at least an easy fix. 🙂 Hope this turns out better for you if you decide to give it another try! Just made this for breakfast. It was delicious! Passing it on to all my friends! Yay, Margo! I’m very happy to hear that you enjoyed this, and thanks so much for sharing the recipe with your friends. 🙂 Hope you’re having a wonderful week! Just made the peach cobbler smoothie this morning and it’s delicious! We got a new blender a couple of weeks ago and I’m now on the lookout for new recipes. I added a tablespoon of ground flaxseed. I now want to try it with other frozen fruit like cherries and strawberries for different variations. Thanks for a great recipe! You’re welcome, Heather…I’m so glad you enjoyed this! 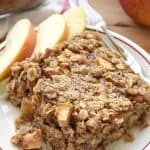 Adding flax seed is a great idea, and it’s definitely fun to experiment with this recipe using different types of fruit. 🙂 Thanks so much for taking the time to comment…happy Friday! ooohhh… as noted above, a little flaxseed or chia seed would be a great addition to up the protein power before work. 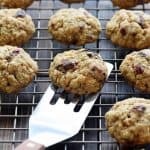 Hi, just wanted to thank you for sharing this recipe. I’ve just had oral surgery and need to stick to liquids for a few days, and I really like this smoothie (with canned peaches) because it’s not too sweet and the oats still my hunger better than a smoothie that’s only fruit and dairy. Once I’ve recovered I’m trying it with frozen fruits as well. I made the Peach Cobbler Smoothie this morning for my boyfriend (who hates eating breakfast) and he couldn’t get enough of it. I used almond milk instead of milk but other than that… it was perfect. I will definitely be trying the rest of your smoothies in the near future. Thanks for sharing!! Can you tell me how many calories these smoothies have? They look really good, I will have to make some. Glad to know this that inorder to taste like “Blueberry Muffin Smoothie” I need to add “smidge of pure vanilla extract and a sprinkle of cinnamon”, I am now excited to try if it’s really taste like baked treats. I will add this to my smoothie collections. So glad it was a hit, Jenn! Can’t wait to try this recipe, I know my family will love it! Both of these smoothies deserve 5 stars!